Pass it on to your neighbor. 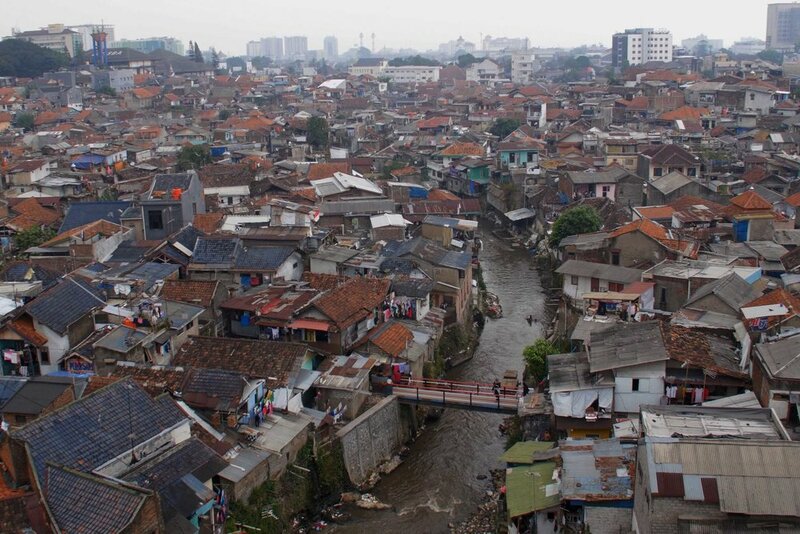 The Cikapundung river is one of the most polluted rivers in Indonesia. Every year, due to a deadly mosquito that spreads Denge fever, several die in huge, extremely overcrowded slums. The river is filled with plastic and industrial waste and no one seem to care about its cleanliness, not even the majority of locals who live on the river itself. Acts of decontamination often only result in locals moving the plastic down river towards their neighbors. The community and the legend. I was asked by the local community to try to do something about it. I agreed straight away as long as they would help provide me with anything I might need. My friends Maiva, Pierre, Lina and Fajar helped me record some interviews with the local community. We also asked about the ancient legend of the river, which very few knew about, and, as often happens with oral tradition, varies every few kilometers. One of the first requests was to involve the kids of the community. We quickly improvised a theatre piece where each child had a role: water, the plastic monster, the family, the mosquito and the moral of the tale. The play is interspersed within the documentary, and its moral speaks directly to the adults of the community. A highway passes above the slum and a small park with a huge TV, which only screens football games, news and ads, is located right next to the community. One of the requests was to negotiate a deal with the local government in order to allow the video to be viewed on the big screen during an event that would gather the entire community. The aim was to empower the community, expanded to the scale of actors and politicians, to take responsibility for their own bad practices in relation to the river. The video would later be distributed over social media.